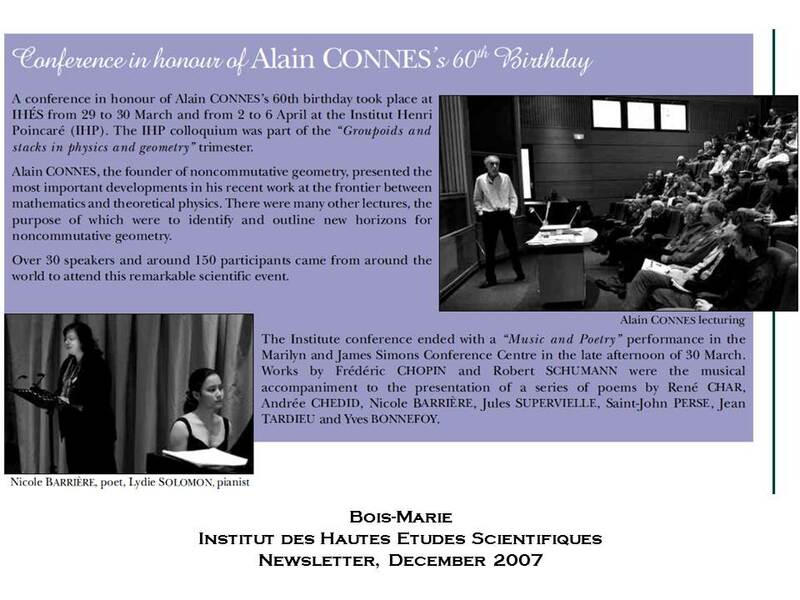 “A conference in honour of Alain Connes’s 60th birthday took place at IHES from 29 to 30 March and from 2 to 6 April at the Institut Henri Poincaré (IHP). The IHP colloquium was part of the “Groupoids and stacks in physics and geometry” trimester. Alain Connes, the founder of noncommutative geometry, presented the most important developments in his recent work at the frontier between mathematics and theoretical physics. There were many other lectures, the purpose of which were to identify and outline new horizons for noncommutative geometry. Over 30 speakers and around 150 participants came from around the world to attend this remarkable scientific event.